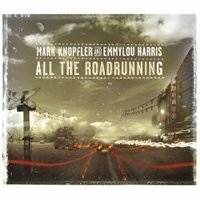 Jay Rand, my lawyer of some fifteen years and one of the best and most experienced VC lawyers in NYC, sent me an email early this year and said, “you gotta get the new Mark Knopfler Emmylou Harris record”. Jay’s a huge Mark Knopfler fan so I wasn’t surprised. I told him I wasn’t sure about Emmylou Harris or Mark Knopfler anymore. Jay said the songs are the best Knopfler has written in a while. That’s all it took. I got the record and it was in heavy rotation for a couple months. The first four Dire Straits records are fantastic. I love Mark’s guitar playing and his soulful voice and great delivery. I haven’t been much of a fan of the stuff he’s done since, although I loved the work he did on several Dylan records in the 80s. I think All The Roadrunning is indeed the best thing he’s done in a long time. The songs are great, the pairing with Emmylou Harris worked out wonderfully. And I love listening to this record. The song that got all the airplay is This Is Us, and it’s a fine tune. But the best songs on the record are I Dug Up A Diamond, Rolling On, and All The Roadrunning. If you are a Mark Knopfler fan and don’t have this record, you are making a mistake. I’ll second Jay’s comment – “you gotta get the Mark Knopfler Emmylou Harris record”.